Recommended to: Readers who are fans of puzzles, and definitely fans of Stanley Kubrick's movies. Do you ever read a book, and end up feeling slightly jealous at how much smarter the characters are than you? Well, prepare to feel that way when you pick up Kubrick's Game. Derek Taylor Kent has woven a story that is full to the brim with puzzles. Shawn and his friends are lead through twists, and turns, all tying into this insane game that focuses solely around Stanley Kubrick's movies. If you're a fan of books that make you ponder, then this one is definitely for you. First off, I need to point out the fact that Kent obviously knows a lot about Kubrick and his cinematic legacy. Each and every part of this story is like a love letter to that creator, and his works. As Shawn delves deeper into the mystery surrounding this game, more and more love is given to the puzzle itself. There are so many clues, expertly created to lead right into the next. My head was spinning after the first few had been uncovered. 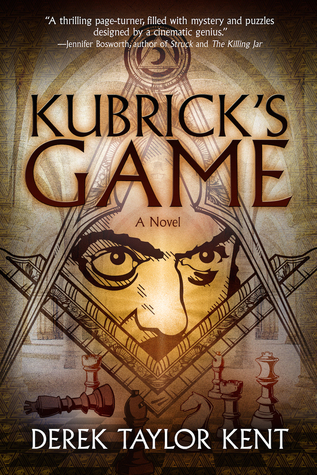 As a person who has definitely seen Kubrick's movies, but isn't a raving fan, I can say that this book definitely prompted me to want to watch them again. I keep wondering if I can pinpoint all the clues myself. Which of course, means that this book picks up speed and then won't let you slow down. Shawn was put in some fairly terrifying situations, all in the name of solving the mystery. I'll be honest, I didn't like him much at first. His blunt personality, and inability to understand relationships annoyed me a bit. Following him through this puzzle though soon made me appreciate his particular brand of focus. He was able to pull himself away from situations, and really see into what he needed to do next. The absolute only reason that I rated this four stars, rather than five, was the fact that the ending felt rushed to me. After so much build up, so many puzzles cracked, and so much time with Shawn, I couldn't help but feel like the ending came and went without a big finish. There are strong ties to all manner of conspiracy theories here, and I would have loved to see some more of those really coming life. The villains here just felt flat, and I wanted more. Overall though? This book was fairly fantastic. As I said, it's a testament to how well written this puzzle is that I was always five steps behind Shawn. He is a brilliant mind. I'll just step away, and let him do his thing.